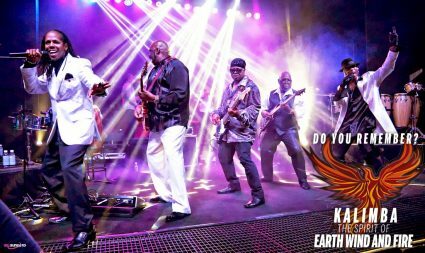 The nationally touring show Kalimba, The Spirit of Earth Wind and Fire provides an Earth Wind & Fire experience so satisfying it transports audiences back to the excitement of the first time they heard these unforgettable songs. Lead vocalist, Thomas “Chazz” Smith, created Kalimba, The Spirit of Earth Wind and Fire in 2011 with the vision of honoring the beloved Earth Wind & Fire hits he and millions of others listened to while growing up. The 10-piece organization includes a full horn and rhythm section to reproduce the infectious grooves created by EWF’s Verdine White and Ralph Johnson. In February the loss of EWF’s founder and musical genius, Maurice White, left the world mourning, but Kalimba, The Spirit of Earth Wind and Fire faithfully honors his work by featuring lush treatments of the soaring vocal harmonies that are the hallmark of Earth Wind & Fire’s music and EWF’s late founder, musical genius, Maurice White. Performances authentically replicate the signature high notes of Maurice White’s sidekick, Philip Bailey.Playing across the country at some of the nations most prestigious and historic theaters, music festivals, state fairs, corporate events and functions, casino’s, and larger clubs as well as upscale private parties and weddings, Kalimba, The Spirit of Earth Wind and Fire includes all of the hits: September, Shining Star, Boogie Wonderland, After the Love Has Gone, Let’s Groove, That’s the Way of the World, Devotion, Reasons, Sing a Song, Can’t Hide Love, Getaway, Fantasy, and Love’s Holiday just to name a few.